New research presented at the Word Economic Forum at Davos highlighted the key skills needed to thrive in the Fourth Industrial Revolution, with the top three skills being ‘Complex Problem Solving’, ‘Critical Thinking’ and ‘Creativity. Gareth Loudon presented some of our new research work on ‘Real-time Biofeedback of Heart Rate Variability Measures to Track and Help Improve Levels of Attention and Relaxation’ at the ACM Creativity and Cognition Conference in Singapore in June. We have secured a 3-year contract to provide management and business innovation training to organisations across Wales as part of the Leading Business Growth programme, jointly run by Bangor University and Cardiff Metropolitan University. The effect the physical working environment has on your creativity has been getting more attention over the last few years. Previously Kursty Groves wrote a book on Creative Spaces in Business and now has a new book out on Spaces for Innovation: The Design and Science of Inspiring Environments where she highlights the “increasing importance of creativity in many industries” and explores the “relationship between the physical design of working environments and levels of creativity and innovation”. The BBC also recently ran a story on the future office highlighting changing trends in office design to try and support well-being amongst staff through the design more playful work spaces, but also through supporting more options in terms of remote working. Another key trend has been the growth in co-working spaces that have tried to support new ways of working and collaborating to encourage creativity. Traditionally they have focused on supporting freelancers and entrepreneurs, particularly in the technology industries, but they are also being used by more established companies, providing employees with flexibility on where they need to work and with the chance to connect with people from different organisations. It also keeps the office rental costs down! You can read more about coworking spaces and the different coworking spaces near you from coworker.com. Anita Füzi (with the support of myself and Prof. Nick Clifton) has been looking at the role of co-working spaces in supporting creativity and innovation in Wales and the challenges faced. You can read more on Anita’s work in the publications section. The Centre for Creativity has recently completed a technical feasibility project part-funded by Innovate UK to study if real-time biofeedback of heart rate variability (HRV) measures can track and help improve attention levels. This included the evaluation of the effectiveness of new HRV analysis algorithms for combined attention and relaxation tracking in real-time; and the study of how to maximise user engagement with this sensing technology, using biofeedback, to train and improve attention levels. The software solution developed runs on an iPhone and communicates wirelessly in real-time with ‘Bluetooth smart’ heart rate monitors such as the Mio Alpha 2 and Mio Fuse watches. The main motivation for the feasibility study was to provide a solution for children who find it difficult to concentrate by providing a way to train and improve their own attention levels. This is of significance as one of the key factors affecting creativity (as well as learning in general) is attention. A solution that can help improve ‘relaxed concentration’ levels for children could have a significant impact on their ability to learn and enhance their creativity. Results from the study showed that it is possible to track attention and relaxation levels at an individual level effectively in real-time. In addition, results showed that participants could improve their levels of ‘relaxed concentration’ using the bio-feedback from the heart rate monitor. The type of interaction presented also had a significant effect on performance. 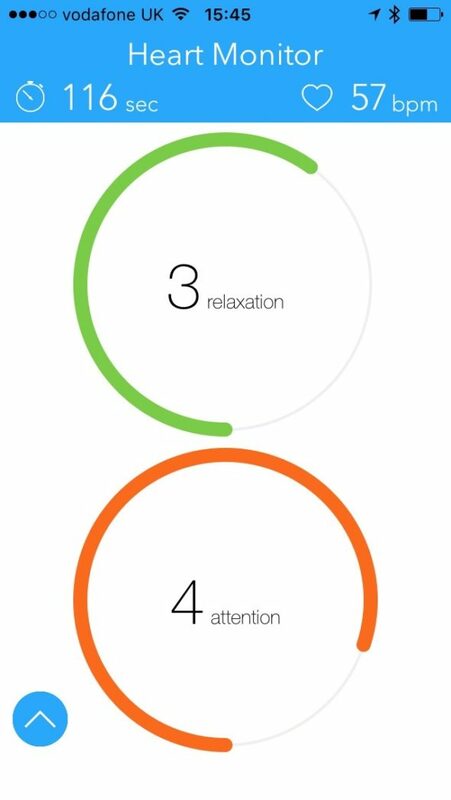 Three different basic interaction modes for the mobile app were created to understand how the interaction mode affected user engagement and the corresponding attention and stress/relaxation levels. 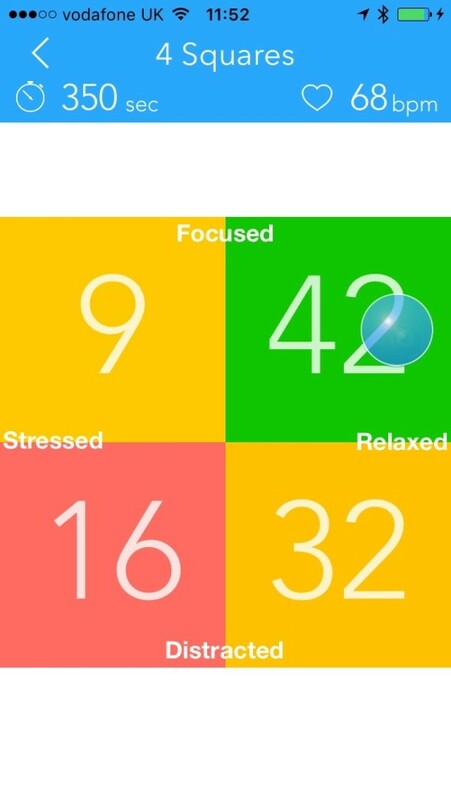 The first interaction mode gave feedback to the user on their level of relaxation and attention by showing their state (via the location of a blue ball) on a focus/relaxation grid (labelled zone game below). Time spent in each zone was shown in seconds. 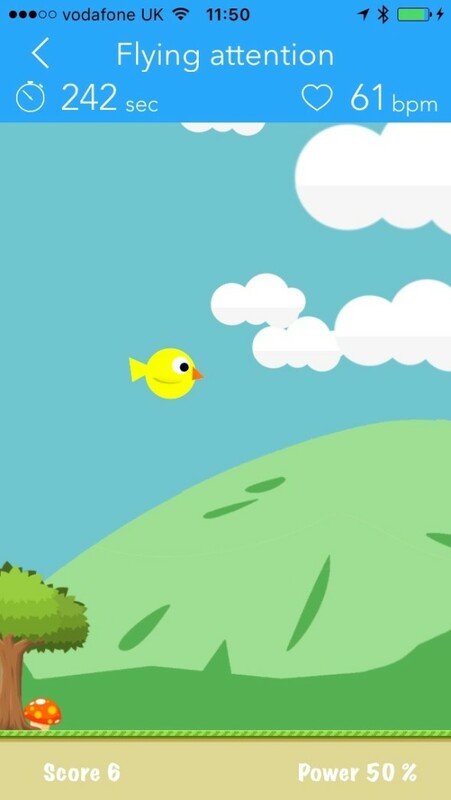 The second interaction mode followed a classic game format, where a combined relaxed concentration score was used to map to the height a bird flies at (labelled bird game below). The bird then collectes points as it flies through clouds, but must fly high enough not to crash into mountains. 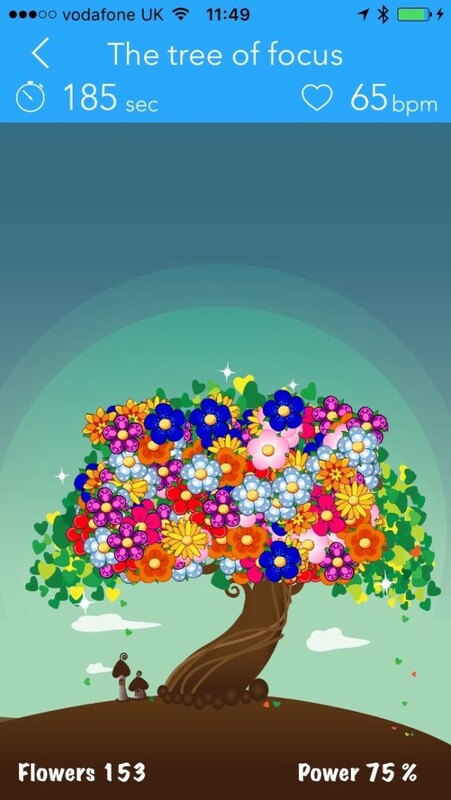 The third interaction mode again used the combined relaxed concentration score as a measure to either enable flowers to appear on a tree (for high scores) or to fall off the tree (for low scores). Results of testing showed that interaction mode 1 (as shown above) performed best, with an increase (on average) in performance (in terms of relaxed concentration) from the first, to second to third attempt of use. Average attention and relaxation levels (across all 3 attempts) were also highest in interaction mode 1 compared to interaction modes 2 and 3. Another key finding from the studies was that interaction mode 1, which provided separate feedback on relaxation and concentration levels, was more useful than having a combined ‘relaxed concentration’ feedback score, as participants knew whether to improve their concentration or relaxation. However interaction mode 3 was seen as the most ‘pleasant’ interface. The watch heart rate (HR) monitors were not as accurate as the chest based HR monitor for tracking HRV, particularly for high frequency (HF) signals of the HRV. This is due to higher levels of HR averaging taking place in the software of the watch HR monitor itself (to minimise errors in HR identification) compared to the chest based HR sensor, however the watch HR monitors still proved effective in tracking and helping to improve attention and relaxation levels with the algorithms used. The results of the feasibility study showed that it is possible to use real-time biofeedback of heart rate variability measures to track and help improve attention levels using HR monitor watches. This has implications for various target markets including children and adults. Such a solution could possibly be used to help children improve their concentration levels at school, or could be integrated with ‘mindfulness’ applications targeted at both children and adults to help reduce stress and promote well-being. In addition, it could be used for niche markets such as sports apps requiring improved levels of relaxed concentration such as golf, or integrated into gaming applications providing a new mode of interaction. Full details of the methodology and findings from the feasibility studies will be published in the coming months.